The Film: While traveling through deep space, the starship Odyssey suffers a disaster. Its reactors go critical, and the ship disintegrates. 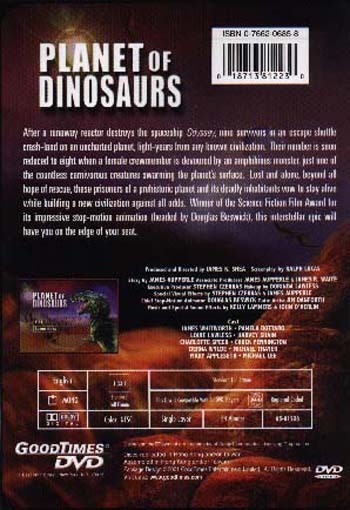 An escape pod, carrying less than a dozen crew and passengers, crash lands on a planet that resembles prehistoric Earth. It even has dinosaurs! These people now have to struggle to survive on an uncharted planet, with little hope of rescue. Tension brews between Lee, the ship�s captain, who wants to play everything safe; and Jim, the engineer, a survivalist who advocates a more aggressive approach. One by one, the human cast is whittled down by various carnivorous creatures. The survivors reach a plateau, where they believe they will be safe from the larger animals. 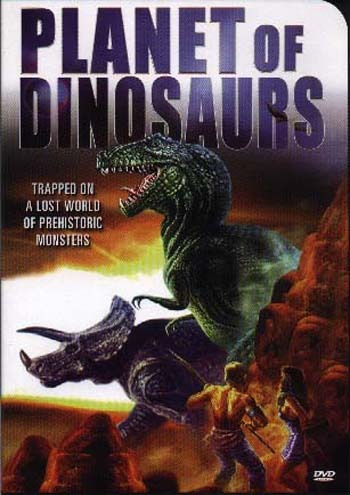 Just as they begin to settle down and establish a home, a Tyrannosaur-like predator smashes their stockade and begins hunting them mercilessly. They will have to overcome their fears, and work together, to fight back and stake their claim on this prehistoric planet. All reviews, articles, and images on this site are Copyright (c) 2003 - 2008.